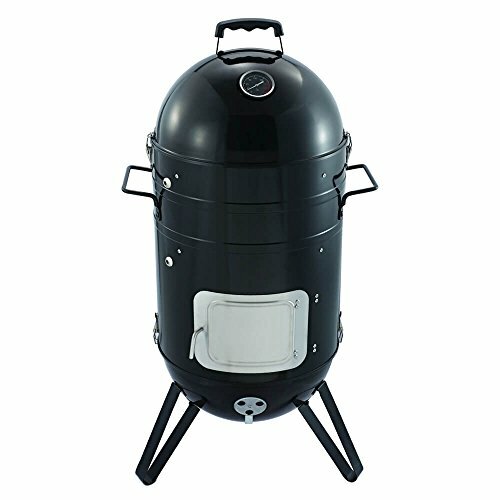 Regardless of the various kinds of BBQ grills or cooking techniques, we all have our own techniques, nothing adds that smoked charcoal flavour like a charcoal BBQ, or that's what the many charcoal bbq fanatics would have you believe, we already looked at some of the best gas bbq's and dug deep into some fantastic portable bbq's. 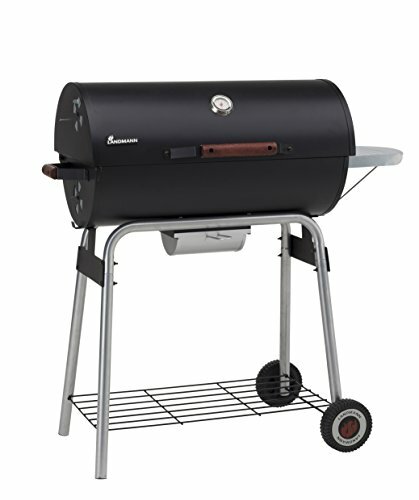 For those of us who are real charcoal BBQ enthusiast, purchasing a charcoal BBQ is not as simple as finding the cheapest model, although price is important of course. There are various features to think over such as the BBQ’s design, do you want a kettle style model, or one with a lid, taking advantage of the convection process which usually results in less chargrill, and more evenly cooked smoke flavoured food, or do you want an open Brazier bbq with no lid for that flame grill effect and fierce cooking. You also have to think about features such as built in thermometers, side racks, removable ash trays as well as build quality and whether it will last, maybe portability if you moving it around or taking it to the park or camping. We have reviewed over 35 charcoal barbecues and below we reveal our top 10 recommended models, before we get into all these models, we will quickly go over our favourite pick below which is the Landmann Taurus 660 Charcoal BBQ, we think it's the best model for most people, its affordable and comes with a 5 year warranty, the build quality it excellent and it had some great features. The Landmann Taurus 660 Large Charcoal BBQ is our 'Best Pick' overall. This model is suitable for cooking for up to 10 people owing to its large 66 x 36m cooking area, making it perfect for garden parties and family gatherings. It also boasts a generous 68 x 18cm warming rack for keeping foods warm without cooking further. This also helps save cooking space on the grilling surface. Also integral into this model is a hood thermometer, a removable ashtray for easy cleaning, removable side shelf to give you a little extra space, wheels to making moving it around a breeze, and a storage area underneath the grill. its also back by an amazing 5-year warranty and so the quality speaks for itself. Sausages and beef burgers are relatively easy to cook on any type of BBQ grill. However, if you want to get more refined in how you cook your meat, then working with a charcoal grill might be the best idea for you. Barrel or kettle BBQ's with lids are perfect for smoking meat and you can even buy smoker BBQ designed with this in mind, you can even hand your your food in them for that authentic smoked flavour or for slow cooking. Garden grillers that think about perfection will need to pick a BBQ that considers some temperature control, specially those who are trying to cook food more evenly using a bbq with a lid and taking advantage of the convection process when cooking food which is full of flavour. The cover or lid of your grill assumes a major part in temperature control and a tight-fitting top is essential regardless of the model you choose. Some charcoal grills come with an adjustable height grill that allows you to alter the distance between the coals and the cooking surface, which makes it simple to increase or reduce the amount of heat your food is exposed to rapidly and effortlessly. Other models come installed with temperature gauges which give precise readings for you to know when to make height adjustment. The Char-Broil Kettleman Charcoal Barbecue Grill is probably the best kettle style model we have reviewed, Charbroil is the bench mark all BBQ try to reach, the cream of the crop, the real deal. Apart from its beautiful finish, the 2568cm2 kettle is more than enough to entertain a big family. This can be set up for various types of cooking due to its TRU-Infrared cooking system. For increased convenience when cooking, the BBQ features a hinged lid, lid-mounted thermometer, and super-sized damper. Its porcelain-coated cooking grates are easy to clean and the grill is easy to move on its wheels. It makes a great option for anyone who’s interested in looks without compromising on performance. It's a little expensive but worth every penny. While charcoal BBQ’s give a superior flavour, one of the drawbacks of picking charcoal over gas BBQ's is that it needs more work to get started and prepare your food how you want as well as clearing up afterwards. Look for BBQ's with have good ash trays and are easier to clean. The only real drawback with charcoal BBQ's is perhaps having to wait for the coals to heat up ready for cooking, remember to allow a good 60-90 minutes before starting to cook your food, this means lighting it early. Some models come with an extra door or pivoted cooking grates that make it less demanding to include more charcoal when needed without removing the food or grates on the barbecue, this is actually a useful feature if you plan on cooking all days as you will eventually need to add more coal which is much easier to do if you don't need to remove the grate. You’ll also come across various models with a removable ash catcher that will make it easy to get rid of the collected ash. This makes a big difference than having to flip over the grill to empty the ash. If you BBQ a lot it may be worth investing in a ash vacuum as this can make cleaning the BBQ much easier, specially if you have a large bbq. The best BBQ’s should last through many years of barbecuing and this means quality materials. The best thing to pay special attention to when looking for a strong BBQ is the construction materials. 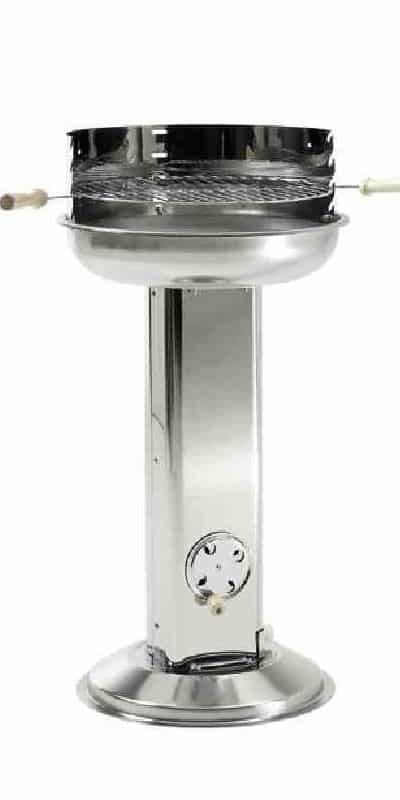 Most BBQ’s feature stainless steel construction and that’s probably the toughest material but the quality and thickness may differ. Customer reviews and the product warranty might also tell something about durability if you can't physically see it built up. The price usually gives the quality away. Cheap BBQ's are cheap for a reason, its worth paying a little more to get better value for money. Hands down the Callow Premium Charcoal Smoker BBQ Grill is the best smoker BBQ. This impressive model can literally perform any method of cooking, whether BBQ grilling, meat smoking, and water smoking. To enable this, it comes with 2 cooking grates, 1 smoking rack, and 6 hooks. Other good features include adjustable air vents, a lid with heat-resistant handles, and access points to the charcoal and water pans. The 0.9mm carbon steel body is also built to last. This is the perfect package for starters and experts alike, great quality at a very affordable price. 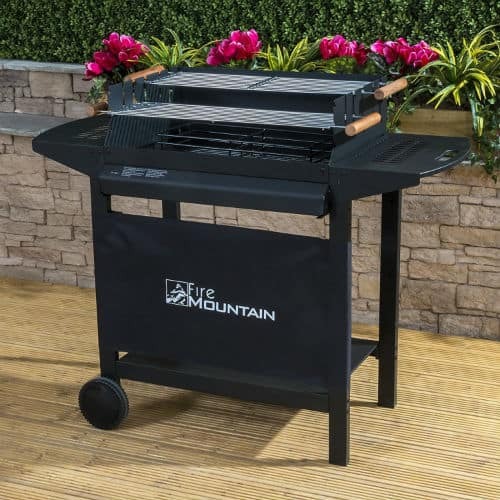 If you need a charcoal grill that you can take with you outdoors or over to a friend’s house, you’ll need one that is moderately light, versatile and somewhat portable like the Landmann Piccolino BBQ below. The size of the cooking surface also matters. If you won’t be regularly cooking for more than four people at any given moment, then any size of cooking surface will do. In case you want to have the capacity to toss enormous patio BBQ’s for bigger gathering, then you’ll need something bigger. All things considered, you’ll need to find a charcoal BBQ with a moderately extensive cooking surface. Most retailers give figures on the number of burgers you can fit on the cooking surface so you can get an unmistakable picture of what’s in store. For those looking for a pack-it-and-go barbecue grill, the Landmann 31377 Piccolino Portable Charcoal BBQ is your best match. This outdoor grill includes a chrome-plated frame, cooking grill and warming rack, plus enameled lid and firebowl. These are durable and easy to clean. 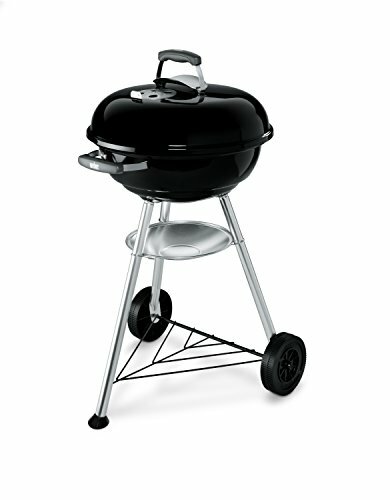 Suitable for four persons, this grill also comes with stainless steel tongs and a bottle opener. Overall a great bbq for taking to the beech, camping or simply for cooking for a small amount of people where space is limited. Most customers equate price to their various needs. If affordability may be your top priority, then a basic barbecue is going to be your best option. In the event that you need a large cooking surface yet aren’t ready to pay a hefty price, you can find charcoal BBQ’s that aren’t necessarily expensive. While you can still get a BBQ for under £100, most buyers will fancy going a bit higher for some reasons. In any case, spending more can get you a bigger cooking surface, a sturdier grill or one that gives exceptional flavour. We found that you could get a very good BBQ, very well made, a good size for around £150 to £200 with the most expensive costing in excess of £600. Similarly as with most types of cooking, security is to a great extent in the hands of the person who is having the BBQ. Ensure you check how the grill functions; read the instructions on some fundamental safety tips for charcoal barbecuing. Some things though only need common sense, like it’s not safe to dispose the ashes until they’re completely doused. The primary thing to look for in a charcoal grill as far as safety is concerned is one that is solid. You got to feel sure it won’t tip over while you’re using it which means it must be on level ground. Don't forget to keep children and pets away too, BBQ's can get very very hot. Affordable and perfect for large families. Painted lid and firebowl to protect it again the weather for heat. Enamelled cooking grill which is easy to clean. Vast warming rack for keeping food warm while still cooking other food. Removable ash catcher for easy removal of ash. Comes with lid thermometer for precise cooking. Removable and sturdy side shelf. 5 Year guarantee for full peace of mind. At first handling, you’ll get the impression that the Landmann 31421 is a solid charcoal BBQ because of the weight of the box – it’s incredibly heavy. As such, we recommend that it’s set up by two people. Of course, one person can build it but it would be a little more difficulkt due to the weight of it and the awkwardness of the parts. There are building instructions however in pictures only which are handy for a few things including the lower shelf. You might find it challenging if you are not good with DIY but if you take your time its no to difficult. It’s quite solid once put up so it’s not one that gets knocked over accidentally. Perhaps what you’ll find more impressive on this charcoal BBQ is the vast cooking area of which can easily cater for more than 10 people. The surface is square-shaped and measures 60cm x 36cm with a huge depth of 53cm which is bigger by far than most models we reviewed. The fact that you can move the coal up and down to adjust the heat is also a huge bonus. Your food remains static during the alteration and that means you don’t have over enthusiastic sausages rolling into the coals or on the ground. The side mounted shelf is a brilliant idea but you may find it’s a bit flimsy so can only cope well with medium sized trays of meat on top. The ash removal tray helps in cleaning the BBQ by simply pulling it out and emptying the tray, the fat also ends up with . the ash as well which is handy, on models we found it leaks out but this model doesn't seem to have any such issues. finally there’s also a lid thermometer which helps you to monitor the cooking temperature, handy if your the type of person to cook with the lid closed for that evenly cooked food with a smokey flavour. Landmann even gives a guide on how to BBQ and how to look after a BBQ which is handy. The removable would be better if it was maybe a little more substantial, overall though does the job. The Landmann 660 Charcoal bbq is a substantial piece of kit and is clearly very well made and looks fantastic when assembled. Assembling really needs two people but with such a large BBQ its not surprising, i would say it could easily cater for 12 people. The reason we decided on this model for our 'Best Pick' is that is really is a well made piece of kit, we really like the fact that you can move the coals closer to your food while cooking, this is a feature we don't see often and is an excellent idea. The tray may be a little flimsy but that not a reason not to buy as it does do its job, just would of been better if it was a little sturdier. Overall this is a excellent BBQ and one well worth considering, it worth noting at under £200 it offers excellent value for money for such a well made BBQ. For most people, this is definitely the model we would recommend. TRU-Infrared cooking system for more evenly cooked food. Lid-mounted temperature gauge monitors the heat inside your grill for optimum control and air vents to help control the heat. Hinged lid with latch which stays open on its own. Porcelain-coated cooking grates for easy cleaning. Super-sized damper for letting air in and out as needed. Heavy-duty steel legs provide maximum stability. Large wheels for easy moving around the garden. 2-year warranty on all parts for full peace of mind. The Char-Broil Kettle? ?man Charcoal Barbecue Grill is an innovative kettle grill loaded with features to provide the next generation in BBQ grilling. First off, this grill uses TRU-Infrared cooking system which cooks more food with less charcoal, allowing longer grilling sessions with 50% juicier results. Its porcelain-coated cooking grates retain and radiate heat evenly over the surface to help reduce cold spots. Consequently, food cooks evenly, retains moisture better and seals in the natural juices of meat. The flames also never come into contact with the food, but tiny holes in the grill allow the charcoal’s aroma and smokiness to reach the food for a traditional taste. The fact that there are no large gaps in the cooking grate allows cooking of slender foods such as shrimp and asparagus. The hinged lid with latch allows you to tend to your food and charcoal and without worrying where to place it down safely. The dome-shaped lid is also perfect for roasting while a lid-mounted temperature gauge helps you keep an eye on the conditions inside the bowl without having to open the lid. And you can always open the damper to let out excess heat or leave it closed to retain heat. Finally as you would expect there is an ash bowl beneath the large kettle to collect any mess plus it’s fully removable for easy cleaning. This product requires home assembly but thankfully the instructions are very clear unlike a lot of other models we have seen which have terrible instructions. All bolts and nuts are clearly labelled so it should be quick to put together and fire up – half an hour and its ready to use! The build is high quality and robust with heavy-duty legs providing maximum stability. It also has good quality caster wheels so you can move it around your patio or back garden with ease. Char-Broil offers a 2-year warranty and it covers all parts. So in case of any damage caused during shipping or any manufacturing default, Char-Broil will replace any part for free so you have full peace of mind. No problems to report. It really is that good. First things first, the Char-? ?Broil Kettleman Charcoal Barbecue Grill is largely the best looking model on the market, I mean just look how sleek and amazing it looks. Its shiny black finish is absolutely stunning. The folks at Char-Broil put so much effort into the design and build of this BBQ, no doubt. We like the TRU-Infrared cooking system and although it slows down cooking a bit, the results are juicier food compared with the standard barbecuing style, there is a noticeable difference, much juicer. The cooking area is impressively vast and we like that small food items can’t get lost through the grill which is a great idea. Generally, the features of this charcoal BBQ are all convenient for outdoor grilling and worth the money as well. What we would say is that perhaps the quality of the shelf near the wheels could be a little sturdier. This model is really as good as our 'Best Pick', however we could only have one best pick and the Landmann model offers more cooking area so just about won, however for anyone looking for a kettle style model, this wins hands down. Highly recommended and a good performer. If your looking for a kettle BBQ which is a little more affordable our next pick by Weber could be a better choice. Suitable for around 4 people. 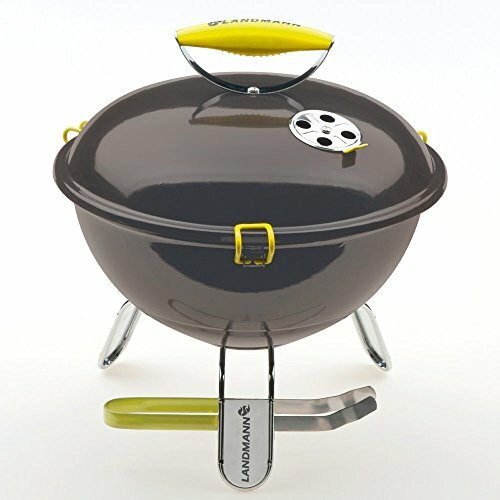 The Weber Compact 47cm Charc? ?oal BBQ truly lives up to its name as it’s a perfect choice for anyone who is limited on space. It’s a good option for the small patio, balconies, and smaller outdoor living areas. The design of this BBQ has been well thought out to ensure that it’s not only easy to live with but also durable. Despite its compact nature, it provides a large 1735cm2 cooking area that’s big enough to cook for four adults. The porcelain-enamelled bowl with lid has two weather-proof handles for easier carrying. Protective heat shields on lid handles make it safer to lift the lid when checking the state of the food. The lid even features rust-proof vents which, together with the rust-proof vents at the base of the bowl, allow proper airflow for perfect barbecuing. Its triple-plated cooking grate is highly resistant to rust and acidity, thus maintain their original looks and remain easy to clean. Right below the bowl is an ash catcher for collecting ash and embers that fall through the base air vents. This helps reduce burn or scorch marks on the ground below the BBQ. Further down the ash catcher is a handy triangular shaped tray which offers a place to store food or utensils that need to be accessed quickly when barbecuing. This unit also has crack-proof wheels on one side to help move it to and from that sweet spot. 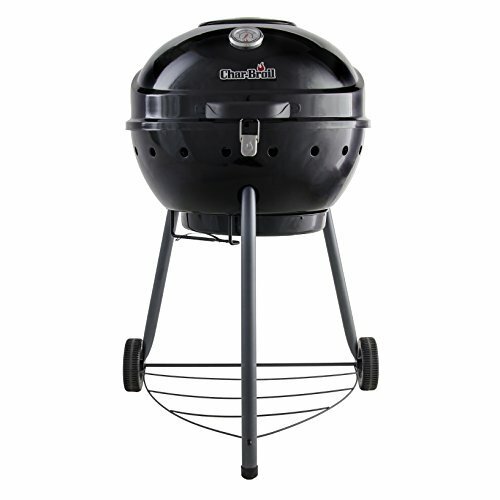 Last but certainly not least, this product is covered by Weber’s unbeatable 10-year warranty. Weber offer a 10 year warranty on BBQ's, however we read a review where a customer who purchased from a well known online seller was sent a model that was pre-2013 build and as such, according to Weber entry guidelines, cannot be successfully registered for the 10year warranty. With this in mind its best checking before purchasing. The Weber Compact 47cm ? ?Charcoal BBQ speaks for itself and we don’t think it needs any alteration when it comes to size. Its not expensive and is a lot cheaper than the previous kettle model we reviewed but its still far more expensive than the cheaper brands you see. That being said it should come with a 10 year warranty, however remember to double check the warranty before purchasing unless it specifically states 10 years warranty when purchasing. Furthermore, the BBQ is very affordable all thing considered, very well made and reliable, with a solid warranty behind it. Overall a great BBQ which is well worth considering if your looking for a kettle style BBQ. Chrome-plated cooking grill and warming rack for easier cleaning and rust resistance. Ventilation disc in the lid to help control cooking temperature. Stainless steel BBQ tongs included which provide extra value for money. Rubberised lid clips for safe transport. Perfect on the go; for the park, beach, and small parks. The Landmann Piccolino Port? ?able Charcoal BBQ is perfect for a day out at the park, sun bathing by the beach, camping, or wherever your outdoor adventures may lead you. With its 34cm cooking grill, this can cook a variety of foods including meat, fish, and veggies for around four people. The grill is chrome-plated cooking grill is easy to clean and it’s highly resistant to corrosion for long-lasting performance. A warming rack is handhy for warming up cooked foods without overcooking them or keeping them warm while you cook more food. The enamelled lid and firebowl are functional as they are good-looking and seen well made. The lid features a ventilation disc that allows airflow when things get too hot inside the bowl, this is handy for controlling the temperature. It also features a rubberised handle that makes it safe to lift the hot lid when cooking. Rubberised lid clips additionally allow the lid to be secured to the firebowl for safe transportation. Assembly instructions are supplied so it should be quick to put together given its compact size. A pair of stainless steel tongs is included which is handy to help grasp and lift food such as sausages, burgers, and steak, and there’s a holder to keep it in place. This model is also available in a range of colours including black, green, azure blue, lavender, anthracite grey, green/yellow, and matt black. The charcoal grill weighs just 3.2kg so is fairly light weight and only measures 37 x 37 x 41cm, so it easily goes into a sizeable bag and is easy to carry around. We love the portability of this barbecue grill, its solid construction, and a relatively large cooking area for such as small BBQ. Assembly is easy and cleaning is also a breeze due to the chrome-plated surface. If you are looking for a way to enjoy grilled foods when camping or going for picnics during the summer months, the Landmann 31377 Piccolino Portable Charcoal BBQ is the best a great choice. Premium quality 0.9 carbon steel construction with powder coating for improved performance and longer life span. Built-in thermometer in lid and 2 meat thermometer probe access points. Adjustable air vents for better ventilation and temperature control. Hinged front door for easy access to charcoal and water pans. Ventilated charcoal pan provides proper air flow. 2 cooking grates, smoking rack, and 6 hooks for hanging food. Comes with weatherproof cover to provide extra protection when not in use. The Callow Premium Charcoal Smoker BBQ?? Grill is another decent option for anyone on a budget. The body is made of high-density 0.9mm carbon steel metal with a powder-coated finish which looks well. This model includes a hood, barrel body, bottom bowl, and supporting feet, which are all connected together by four stainless steel locks. With two food racks of 14-inch diameter, this allows you to cook plenty of food at once. There’s also a smoking rack that can be hung from the top of the BBQ’s mouth for smoking or grilling fish for anyone who a fan of smoking food. You also get 6 hooks for smoking fish, sausages, ribs, and other foods. Unfortunately, there is no side door to access the lower rack so the only way is through the top. On the good side, the top rack is designed to get out of the way when you want to access the bottom rack. A lid-mounted thermometer with temperature gauge also allows you to monitor the cooking/smoking conditions, whilst adjustable air vents at the base and in the lid allow decent airflow and improved temperature control. The charcoal pan is accessible via a hinged front door, allowing you to top up without losing most of the heat. The fully ventilated charcoal pan also provides good distribution of heat to ensure your food cooks more evenly. And when your food is ready, the lid clips out of the way on its heat-resistant handles for safe serving. Assembling this model is pretty straightforward. All the nuts and screws are clearly labelled and the instructions are easy to follow. A weatherproof cover completes the package to protect your investment during the predictable British weather. Nothing to report hear, putting together is not really easy, some may find it a little challenging. If you take your time its fairly straight forward but does take a while. On features versus price, the Callow Prem? ?ium Charcoal Smoker BBQ Grill is a great buy and offers great value for money and comes at an unbelievable price. It even includes a cover, something that’s sold differently with many other models. This BBQ grill does the job and is especially ideal for smoking stuff which is what its really designed for rather than being a typical BBQ. The build quality is good for price and it’s easy to use. Overall an excellent smoker BBQ that is very affordable. CHARCOAL & GAS - BEST OF BOTH WORLDS! Best of both worlds, gas grill on one side so you can get up and running in minutes and traditional gas bbq on the other side or use together for a very impressive 1,260 square inches of BBQ grilling and smoking space. Heavy steel construction and porcelain coated cast iron cooking grates - Made to last. 3 stainless steel burners with electronic ignition with additional gas side burner. Body built from heavy gauge steel designed to last. Stainless steel temperature gauge for keeping an eye on temperature and adjustable temperature as needed. Chrome-plated warming racks, easy to clean and last longer. Push button electronic ignition for gas grill. Porcelain coated cast iron cooking surface which are easy to clean. Everything about the Char-Griller 5050 Duo Charcoal BBQ is steel, the first thing you notice is how well made this BBQ is. The body is built from heavy gauge steel while the cart features thick tubular steel. 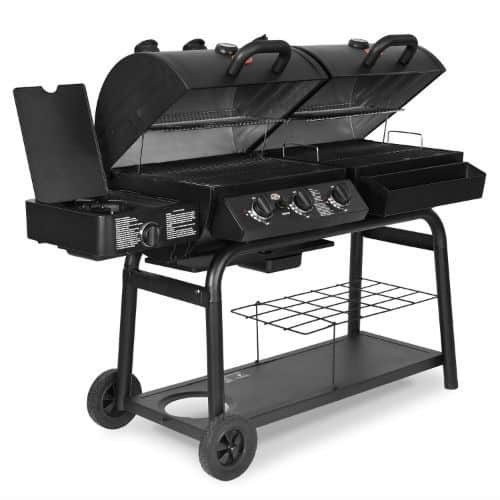 Nothing beats the cooking power of this grill with 3 stainless steel burners on the gas side. There’s more than 1,200 sq. inches of cooking space when you combine gas and charcoal combined. The charcoal and gas combination is a great advantage over most other models meaning you have an option in case you run out of either fuel. The big advantage is if you don't have to much preparation time you can simply ligt the gas BBQ, if you have the time and like that traditional smokey taste then light up the coals, got a big party, get both sides up and running. There are 3 smoke chimneys, a temperature gauge which helps you to regulate heat and it’s also made from good quality stainless steel. It features stay cool handles which are comfortable even when the grill is hot. The chrome plated warming racks are a great additional feature while the push button electronic ignition comes handy when using gas. When cooking on the charcoal side, the cast iron cooking grates are excellent for heat transfer and the double layer bottom retains the heat and protects the steel finish. Add on the separate firebox and you can use this charcoal grill for smoking. And while you’re still cooking, waste fuel collects in the damp ash pan which is pretty easy to clean thereafter. This charcoal grill does needs assembly and can take a long to put together because of the sheer size. The good thing is that instructions are easy to follow and you will soon be firing her up. What to be aware of! The drip pan for the gas side is a bit flimsy and probably could be improved. Its also fairly expensive but you are getting a very big BBQ. The Char-Griller 5050 Duo Charco? ?al BBQ is probably one of the most solid charcoal BBQ's on our list. The body and other components are made of steel which is probably the toughest material for building most BBQ assuming its a good thickness and that sums up why this charcoal grill is the most expensive product in our list. This is obviously one of the best BBQ's for a garden parties or those who simply want the best of both worlds, however it is on the more expensive side. Overall a fantastic BBQ. Height Adjustable grid with crank mechanism. 1 “Toronto” Trolley Grill included. The Tepro Toronto Trolley Grill is the ideal affordable BBQ for genuine barbecuing fun whether on warm summer evenings. Working with this charcoal BBQ starts from assembling and the process is relatively easy with the help of the assembly manual. Some steps are a bit tricky which we have noticed is becoming a trend with BBQ's and ideally you need two people to build. Temperature control is crucial when cooking so Tepro has installed a thermometer in this grill cart to help you monitor the temperature. Once you have the figures on the thermometer, you can alter the distance between the coals and cooking surface to adjust the cooking temperature of your food. Another advantage of the built-in thermometer is it allows you to know precisely when to add charcoal so your BBQ keeps going long into the night. Even so, the two-tier design of this grill allows you to enclose the grill region to keep heat from escaping out of the grill. There are air vents that guarantee uniform air circulation during the cooking process while preventing the coals from extinguishing when the top is shut. The two-tier design combined with the smooth-action lid makes indirect grilling easy – a cooking technique where the food rests in an enclosed space and not directly over the fire. Whether you want to entertain your children on your garden or guests on the patio, this charcoal grill cart is perfect for flexible barbecue fun. The availability of a bottle opener along with utensil hooks sum up to the best grilling companion you can have. No problems to report with this model. Apart from assembling taking a while to put together, the Toronto Trolley Grill is easy to work with and very well made, nice and sturdy, very solid piece of kit. The bottle opener and utensil hooks are also bonus features that will make for a great BBQ party. Overall is a simple but well made BBQ and should last for many years. At a little over £100 when we reviewed this model, it also offers excellent value for money. Comes with two adjustable grills which can be set over 3 heights. Three levels of cooking or keeping food warm. Constructed from tough, powder-coated steel. Cooking area: 63 cm width, 38.5cm depth. The Fire Mountain Deluxe Trolley Charcoal BBQ is one of the cheapest BBQ's in this review and for the price you get a fantastic BBQ. We have reviewed Fire Mountain BBQ's before and they also impress and this model is no different, the only thing you may notice is this model does not have a lid. It takes about an hour to assemble following the instructions manual. Nonetheless, putting the parts together takes about an hour and its fairly straight forward. It has a relatively large cooking area split into two levels and both have chrome steel grills which can be adjusted to over three heights. This kind of flexibility offers a great way of grilling various types of food simultaneously. When on the highest level, the back grill can likewise serve as a warming rack while the other food cooks. 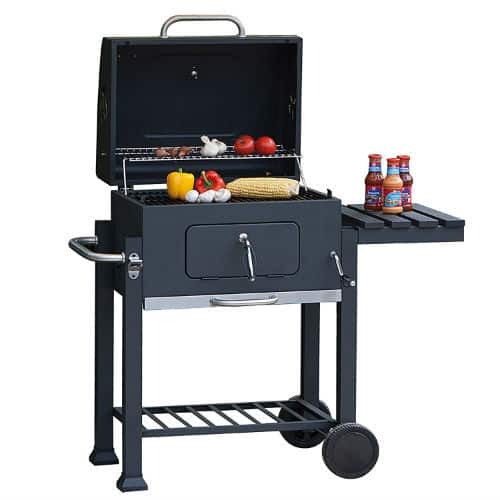 Most good charcoal BBQ’s are built tough and this Deluxe model is no exception, thanks to the solid steel construction with a black powder coating which prevents wear. To make the cooking more fun, there are two black side racks for holding plates and condiments or for arrangement while the food is cooking. Underneath the grill you’ll find a substantial space to hold extra charcoal or dishes, holed up at the back of the fabric front. Another noteworthy feature is the two wheels on either side which allows for movement and repositioning or rolling into a storage area when not being used. The assembly instructions are a bit lacking and the space for the coal is relatively small compared to other charcoal Barbecues of about the same price. The Amazon we noticed this model has over 50 reviews overall is an excellent BBQ, it's very well made and the price at under £100 makes it one of the most affordable models in our review. With three levels of cooking and warming food, it’s one of the most versatile charcoal grills in our reviews. The only thing it does lack is some king of lid, we can't help wonder if this would become an issue if it started to rain. On Amazon we noticed this mod? ?el has ov? ?er 50 reviews, most of which are very positive so maybe the lack of a lid won't prove to be a problem. Very affordable with chrome plated design. Cooks food for up to 4 people. Ventilation disc for extra heat control. Landmann has been a major player in the realm of grilling for more than 40 years and they’re known for manufacturing practical, functional and lightweight products. This Stainless Steel pedestal charcoal BBQ is a younger brother to our previous Landmann model which can only cook for up to four people. Landmann constructed this BBQ using stainless steel and gave it a modern design making it a perfect outdoor companion for any home. The Grill-Chef is easy to put together and only requires pairing the nuts and bolts together to fix everything in place. The process takes about 10-15 minutes which is far quicker than most other models. It also comes with an instruction booklet which can be of great help to first-time users. The grill is height adjustable which makes for more controlled cooking while the ventilation disc provides air circulation for further heat control. It also comes with a removable ash catcher for disposing waste fuel. The frame is somehow wobbly and it’s a bit fiddle to assemble especially when dealing with the pedestal. This Landmann Stainless Steel ? ?Barbecue is perfect for anyone looking for a cheap and cheerful BBQ, the problem is many cheaper BBQ's are not of the nest quality but this model is a brilliant little BBQ. Much better than the supermarket models you see. It’s compact and lightweight for moving around anywhere, cooks great and the stainless steel construction is a huge bonus for the money. Overall and excellent little no thrills sturdy BBQ. Smoky flavours are awesome, yet the entire experience of BBQ’ing outside with family and buddies is an essential part of the equation. We hope you’ve learned from the best charcoal grills from our product reviews and next time you want to buy one remember to go back to our guide. After many hours of research, there really isn’t a “best” charcoal grill that can be recommended to everyone, the fact is, not everyone requires the same features or the same size BBQ. There are many things that need to be taken into consideration before picking out the charcoal grill.